Magistrix Urili Vox, sometimes simply referred to as Vox, is a Dunmer and the leader of the Maulborn. She is a former member of the Tribunal faithful who unleashed the Llodos Plague on Deshaan and stole the Judgment of Saint Veloth from the Tribunal Temple in Mournhold. Her son's death allowed Boethiah to persuade her to do this. Urili's son, Meram Vox, served Boethiah and tried to steal the Judgment of Saint Veloth. 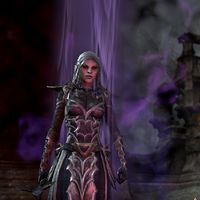 For his crimes and Daedra worship, Almalexia killed him while Urili begged her for mercy. While wielding Judgment, Vox has almost godlike power due to a large amount of trapped souls. Vox wields the hammer Judgment in combat. Urili Vox: "You mustn't do this, my son. Defying the Tribunal is a death sentence." Meram Vox: "Enough, Mother! Your faith in false gods blinds you to the truth." Urili Vox: "You mustn't say such things, Meram." Meram Vox: "Silence, Mother! The Daedric Princes return. I welcome them as the true gods of this land." Urili Vox: "Please, Meram! Come back. I don't want to see you get hurt." Almalexia: "My child, why have you spilled innocent blood? What has led you to perform such evil?" Meram Vox: "You are a lie, Almalexia! A false god! I renounce you as the impostor you are!" Almalexia: "You show no remorse and your crimes cannot be ignored. Let this be a lesson to all who would oppose the Tribunal." Urili Vox: "No, my lady! Mercy! I beg of you! He's my only son!" Almalexia: "What mercy did Meram show his victims? I am sorry, dear, Urili, but he has earned this punishment." Urili Vox: "False gods. False justice. Meram was right. The Daedric Princes must return. And blood must flow!" Urili Vox: "Let them die. Let them rot. Let them feel my pain. No false gods can stop me!" Shadow of Boethiah: "Yes, Urili, yes. Let you plague spread across the land as your rage fills you and makes you strong. But you need Veloth's hammer. You must take it for your own." Urili Vox: "The Judgement? That's what my son sought to possess. Yes! It will be mine! And with Judgement in my hand, the Tribunal shall fall!" Shadow of Boethiah: "Go. Gather your followers. Spread your plague. Wield the hammer. With it, you can devour living souls and unleash your true power!" Urili Vox: "Heh heh. You think to hide from me, intruder?" Urili Vox: "I. See. You. Heh. Heh heh." When you approach Magistrix Vox, she will address you. Magistrix Vox: "You! The meddler from my memories. Have you come to die?" "You shattered my wards. You entered my Hollow in service to a false god. I'm impressed you made it this far. But your interference ends here!" "Kill you? I could have done that long ago. You are strong. You overcame obstacles that blocked even the false goddess. Why kill you? You'd make a fine ally." I'd never help anyone who murders the innocent. "Innocent? Innocent? You saw what your goddess did to my son! Why do you choose to be a willing slave of those imposters? Think for yourself. Stand with me." No. You must be stopped. "You utter fool. Stop me? Not even the Tribunal can stop me. The power of Veloth's Judgement courses through my body. You shall feel its power as I take your life and absorb your soul!" "The Tribunal is a lie. They were born as mortals, no more divine than we are. Who are they to sit in judgment on us? They just found a way to gain and wield great power. As I have. And as you shall, if you join me." "Let me absorb your strength, combine it with my own. Have no fear. You won't die, but you will become part of something greater than yourself. Hold still while I strike you with the Judgment. Strike you—and make you immortal!" Magistrix Vox: "Your spirit will give me the power I need! Together we will triumph over the Tribunal!" Magistrix Vox: "You have tried my patience long enough! Feel the wrath of Veloth's Judgment!"